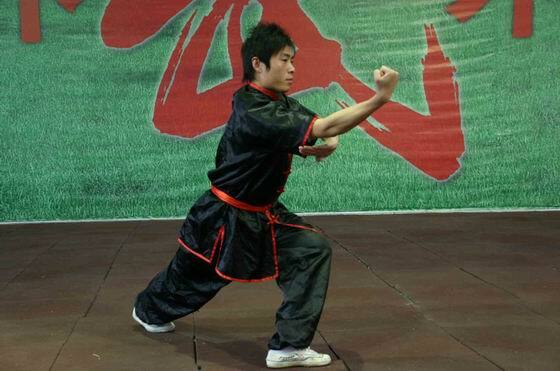 Fanzi Quan(Tumbling Chuan) is part of Chinese martial arts. Fanzi Quan is also known as Bashanfan (eight-flash Chuan). It is so called because of its eight major flashing movements, which are executed as fast as lightning and thunderclaps. The movements in tumbling Chuan are varied and continuous. The Fanzi Quan ballad says: “Wu Mu has passed down the Fanzi Quan which has mystery in its straightforward movements.” Wu Mu is the other name for Yue Fei, a famous general of the Southern Song Dynasty. Some people have taken this to mean that Fanzi Quan was created by Yue Fei, but no historical record has verified this. exactly tumbling Chuan of today. Bashanfan was the old name used in the Ming Dynasty. From Qi’s account, it is evident that Bashanfan was already a comparatively complete and perfect style of fist fight in the Ming Dynasty. Fanzi Quan centers on the Bashanfan (eight-flash moves) while others are merely derivatives of this. During the Qing Dynasty, Fanzi Quan was popular in north China, especially in Raoyang, Lixian and Gao-yang areas in Hebei Province. During the reigns of Qing emperors Xianfeng and Tongzhi (1851-1874), a recluse called Zhao Canyi lived at Raoyang in Hebei. Zhao was not only proficient at Fanzi Quan but was also well known for his master/ of Chuojiao Quan (feet-poking Chuan). He taught the Chuan arts to Duan and Wang families respectively. The brothers of Duan Zhixu and Duan Zhiyong learned Chuojiao while Wang Laozi and Wang Zhan’ao studied Fanzi Quan. Later on, the two families taught each other and exchanged their knowledge. Fanzi Quan stresses the use of hands, whereas Chuojiao emphasizes the use of feet. Modern Fanzi Quan experts often practise feet-poking skills as well. Fanzi Quan spread far and wide after it was introduced into Hebei, developing many branch styles. The eagle-claw tumbling Chuan was evolved on the basis of a combination of the eagle-claw moving Chuan, eagle-claw running Chuan and tumbling Chuan. When hitting, the hand is in the form of clenched fist. When retrieving, it is in the form of an eagle claw. Fist jabbing can be as fast as the swing of a whip and as relentless as teeming rain. Another combination is Digong Quan (ground stroke Chuan) and Fanzi Quan tumbling Chuan, called Digong Fanzi Quan (ground stroke tumbling Chuan). It absorbs both the tumbling Chuan tricks of fastness and variation and the ground stroke Chuan moves of falling, pouncing, wrestling and leg locking. Because there are some feet-poking tricks in the ground stroke tumbling Chuan, it is also called by some the feet-poking tumbling Chuan. Other combinations include Shaolin tumbling Chuan, long-style tumbling Chuan, short-style tumbling Chuan, Yanqing-style tumbling Chuan and soft palming tumbling Chuan. Contemporary Fanzi Quan master Yu Boqian not only inherited the tumbling techniques from his predecessors but also improved it by programming two new routines of wave-poking tumbling Chuan and back-rolling tumbling Chuan. Fanzi Quan stresses the combination of external and internal strengths and energies. Exercises involving the circulation of air flows inside the body are carried through the water conduit, blood vessels and network of sinews which Chinese medicine believes exist in human bodies. These three networks and channels merge under the guidance of the mind. Tumbling boxers take root in their legs while emphasizing hand tricks and movements. The tumbling exercises are divided into two classes of major moves and minor moves. The major moves include jabbing, axing, elbowing, jamming, wrestling, rubbing and holding. The minor moves are rolling, lifting, turning, penetrating, slipping, hammering, provoking and flicking. In tumbling Chuan, the routine is made rhythmic by slow and fast movements, continuous and intermittent actions. Tumbling boxers prefer to fight in a straightforward way. They change freely from hardness to softness and vice versa. When the hand hits out, the foot follows with a quick step. The body clutches together while moving around fast. The fist never hits out aimlessly nor does the hand retreat without trying to attack on its way back. The routine of tumbling Chuan is short and terse. Its movements are agile and quick and arranged in compact patterns. While practising, the footwork is steady, posture upright and square, and actions are versatile. One moment the two fists hit straight and the next they are rounded for their attacks. Various tricks and moves are like whirl-winds and the entire routine is completed as if in one breath. The fist hits of tumbling Chuan are described “as dense as rain drops and as fast as a burn-ing string of small firecrackers.” The tumbling Chuan stresses crisp, fast, hard and resilient movements.